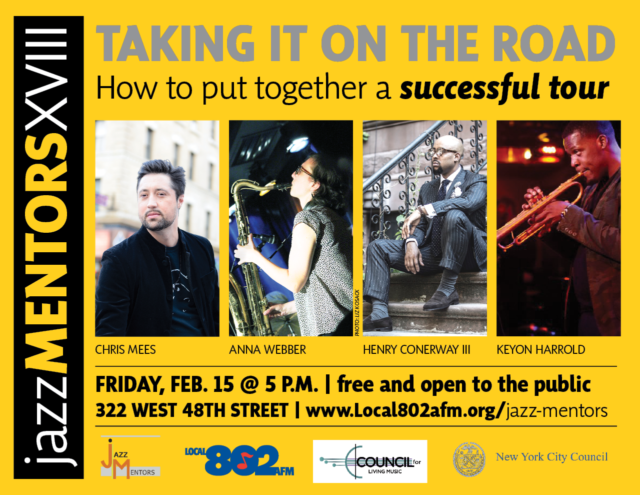 Jazz Mentors XVIII “Taking it On the Road: How to Put Together A Successful Tour” brings together three formidable artists to discuss the self-booked tour. Avant-garde flutist-saxophonist-composer Anna Webber has extensive experience putting together her own tours internationally and across the US. Trumpeter Keyon Harrold has frequently headlined with his own unit and this spring will be appearing across the US and in the Netherlands. As founder of B Natural Management and co-director of J. Chriss & Company, Chris Mees serves as an agent of change in the music industry and is highly sought after as a consultant for jazz, blues, and world music. These performers will discuss the logistical, economic, and artistic demands of touring from the unique perspective of the Indie Jazz Artist. Not to be missed! Learn more about the panelists here. For more info, contact Todd Weeks.